Covering the period from the death of Alexander the Great to the celebrated defeat of Antony and Cleopatra at the hands of Augustus, this authoritative Companion explores the world that Alexander created but did not live to see. Comprises original essays by leading international scholars. 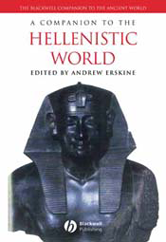 Essential reading for courses on Hellenistic history. Combines narrative and thematic approaches to the period. Draws on the very latest research. Covers a broad range of topics, spanning political, religious, social, economic and cultural history.